New 2017 Release! NIST 17 now shipping! Increased coverage and quality in all libraries (EI MS, MS/MS, and GC RI). Nearly 3x increase in MS/MS. Please see Update Registion to receive e-mail notifications when future updates to your NIST and/or Wiley MS libraries are available. World's most widely used and trusted mass spectral reference library. Search software included. Supports most MS software systems (Agilent ChemStation/MassHunter, Thermo Xcalibur, Shimadzu GCMS Solutions, Waters MassLynx, Thermo Xcalibur, PE TurboMass, etc.). The NIST 17 mass spectral library, the successor to the NIST 14, is a fully evaluated collection of electron ionization (EI) and MS/MS mass spectra, with chemical and GC data, plus search software to identify your own unknown spectra. It is a product of a more than three decade, comprehensive evaluation and expansion of the world's most widely used mass spectral reference library by a team of experienced mass spectrometrists at the National Institute of Standards and Technology (NIST) in which each spectrum was examined for correctness. Electron ionization (EI) mass spectral library - 306,622 carefully evaluated spectra of 267,376 unique compounds, with identifications, nearly all with chemical structures. You may search names of NIST compounds online. 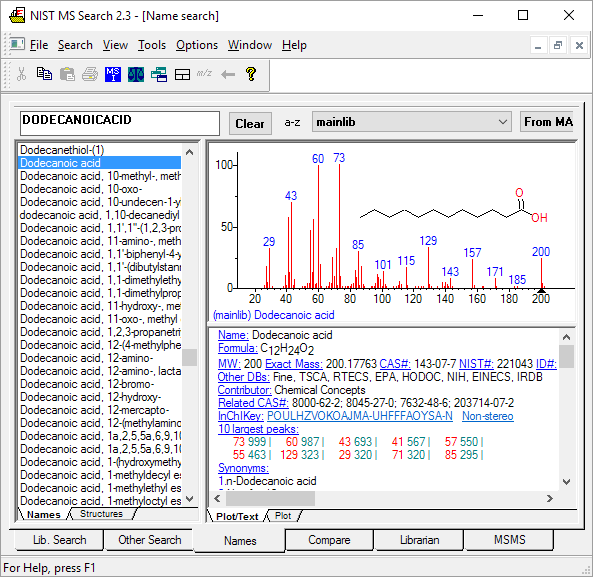 NIST MS Search software - software for searching (identifying) compounds from their mass spectra and for browsing mass spectral libraries. Also includes MS interpretation programs for analyzing mass spectra on the basis of chemical structure, molecular formula, isotopic patterns, and more. Documentation - Approximately 50 page printed and electronic manual on setup and basic usage. Additional information is in the help files. With each purchase, we ship a DVD (installs software, libraries, and documentation) and a printed manual. If you don't have a DVD drive, you can electronic download using the web address and license number on the DVD label. To check for compounds in the NIST library, you may search names of compounds online. Statistics for NIST versions are given below. See also What's New in NIST 17. This is a "fully evaluated" collection of electron ionization (EI) mass spectra. It is the product of a more than three decade, comprehensive evaluation and expansion of the world's most widely used mass spectral reference library by a team of experienced mass spectrometrists in which each spectrum was examined for correctness. Each spectrum has been carefully evaluated, and all decisions regarding selection or deletion were made only after agreement of two experienced mass spectral evaluators, as described in presentations at major conferences. While computer methods assisted in finding chemical identification errors and inconsistencies, and revealed certain varieties of mass spectral errors, manual interpretation was the principal basis for this evaluation effort. The Electron Ionization (EI) mass spectral library consists of 276,248 spectra of 242,466 unique compounds. Besides spectra, typical data include name, formula, molecular structure (.mol), molecular weight, CAS number, contributor name, list of peaks, synonyms, and estimated and/or measured retention index. Figure: NIST MS Search software showing EI mass spectrum and compound information. The best quality spectra are placed in the Main Library; and good-quality, alternate spectra are provided in the Selected Replicates Library. To check whether certain compounds or classes of compounds exist within the NIST database, you may do an online search of compounds in the NIST MS database. 1662 Chuck Anderson, Aldrich Chemical Co.
702 J.E. WILKINSON S-CUBED, SAN DIEGO, CA. 396 Leung Pu, NIH, Bethesda, Maryland, U.S.
272 Richard Turcotte. Direction des laboratoires d'expertises et d'analyses alimentaires, Quebec, Canada. 198 D.G.Hayward MS, Center for Food Safety and Applied Nutrition, FDA, College Park MD. 179 ATLAS OF MASS SPECTRA OF ORGANIC COMPOUNDS, V. A. KOPTYUG, ED. 135 B.R. PETTIT, QUEEN CHARLOTTE'S MAT. HOSP., LONDON, U.K.
134 J.T. CLERC, ORGANIC CHEM. LAB., ETH, ZURICH, SWITZ. 115 H.LAATSCH,INST. ORG. CHEM.,GEORG-AUGUST-UNIV. GOTTINGEN,W.GER. This release contains two MS/MS libraries (nist_msms and nist_msms2), one for small molecules, di and tri peptides and the other for commercially available peptides. It has 652,475 spectra of 123,881 ions of 15,243 different compounds including 1,436 biologically-relevant peptides. See NIST MS/MS for details on the MS/MS library. Most of the MS/MS spectra have been measured on ion trap and collision cell (qTOF, QQQ, and HCD) instruments using electrospray ionization, although spectra from a number of other instrument types and ionization methods are represented. The MS/MS Library can optionally be purchased separately at a lower price (with a complete copy of the MS Search software), if you are not interested in the other data in NIST. Tip: Even though MS/MS and EI spectra differ and MS/MS spectra are therefore only directly library searched against the MS/MS library, there are still ways to utilize the EI library for MS/MS interpretation. See the article Structural Identification of Unknowns from Spectra Obtained Using LC/MS and CAD Techniques and EI Mass Spectral Database. Figure: MS/MS search tab in NIST14. Spectra organized by positive/negative charge, mass, formula, compound name, and acquisition energy/conditions. Tip: You probably have heard of the NIST MS Database. But have you heard of the NIST GC Database? The GC Database is also available separately at very low cost, so you can provide it to each of your chemists to run on their desktops. Gas phase retention data for compounds common to the EI and NIST Retention Data collection are provided with links to the EI library. This involves 387,463 Kovacs retention indices and corresponding GC methods, column conditions and literature citations for 82,868 compounds. Data include both non-polar and polar columns. Most values were abstracted from the open literature and then compared to replicate values and estimates to find and remove errors. We also continue to provide estimates of retention indices for most compounds in the library using an extension of a method developed earlier for boiling points [2-3]. GC column info: column type (Capillary or Packed), column class (Semi-standard non-polar, Standard non-polar, or Standard polar), column diameter (e.g. 0.25 mm), column length (e.g. 30 m), active phase (e.g. DB-5), substrate (e.g. Chromosorb W), phase thickness (e.g. 0.25 um), and carrier gas (e.g. N2/Helium/H2/etc.). Retention index data: Retention index type (Normal alkane RI, Linear RI, Kovats RI, Lee RI, Normal alkane RI value specified by scale definition, Lee RI value specified by scale definition) and retention index (e.g. 514). Compound identification: Name (e.g. Limonene), Formula (e.g. C10H16), Synonyms (e.g. Cyclohexene, 1-methyl-4-(1-methylethenyl)-), INCHIKEY (e.g. XMGQYMWWDOXHJM-UHFFFAOYSA-N) (lookup), ID (e.g. 33687), CAS Number (e.g. 138-86-3), and NIST NIST Number (e.g. 79639). and antibacterial evaluation of essential oils from Ottonia Martiana Miq. (Piperaceae), J. Braz. Chem. Soc., 18(1), 2007, 184-188.
fragrance, and many other compounds on DB-1 and DB-XLB, 2003. The GC data is useful not only for the GC retention index values but also for the GC column conditions and cited literature that goes with it. Figure: NIST MS Search software showing GC method and retention index data for a compound with an EI mass spectrum. See NIST GC/RI for details on this library.
. Babushok, V.I., Linstrom, P.J., Reed, J.J., Zenkevich, I.G., Brown, R.L., Mallard, W.G., Stein, S.E., Development of a database of gas chromatographic retention properties of organic compounds. J.Chromatog. A, 2007, 1157, 414-421.
. Stein, S.E., Brown, R.L. Estimation of normal boiling points from group contributions. J.Chem.Inform.Comput.Sci., 1994, 34, 581-587.
. Stein, S.E., Babushok, V.I., Brown, R.L., Linstrom, P.J., Estimation of Kovats retention indices using group contributions. J.Chem.Inf.Modeling, 2007, 47, 975-980. The updated, full-featured NIST MS Search Program for Windows has a full range of integrated tools. 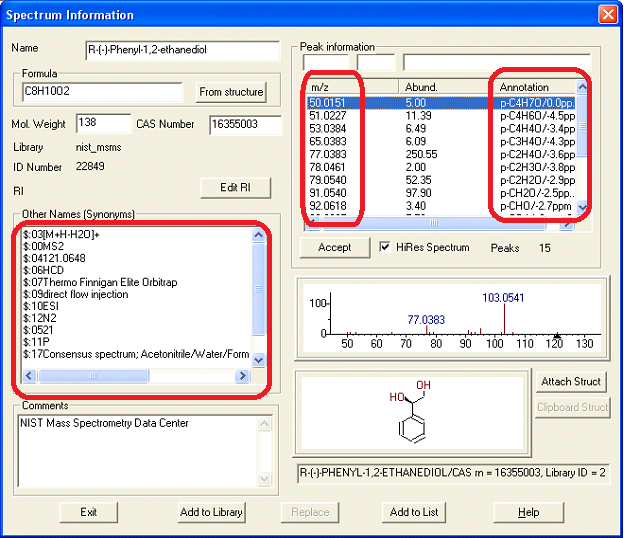 The new updated version of this widely used, full-featured software is designed for identifying compounds from their mass spectra and for exploring mass spectral libraries. It also contains tools for deconvoluting gas/liquid chromatograms and interpreting mass spectra. Tip: If you've used older versions of NIST MS Search (especially before 2005), see all the features that have been added to the last four editions. integration with a number of commercial GC/MS data systems and spectral analysis tools. When the program is first started, seven tiled windows appear on the screen (the Desktop), each with its own data and behavior. The behavior of any Window may be modified by making it active (clicking on it) and then pressing the AdjustWin button at the bottom of the Desktop. As you become familiar with program operation, you may wish to change the dimensions of some Windows or even close some of them to create a custom Desktop. When the program is restarted, it will begin with the most recent Desktop. To save a window-arrangement Desktop for future use, select Desktop from the Menu Bar and then Save As from the resulting Menu. Prior Desktops may be restored using one of the predefined names or your own name. Such arrangements describe the geometry and type of information shown in each Window, not the actual data contained in it. To restore a previous hit list, select it from the list at the top of the Hit List Window. Library Searching - Identify unknown compounds and substructures using fully documented and optimized procedures, or search by a wide range of compound and spectral properties. Library Building - Maintain your own libraries, add your own chemical structures and search using the same optimized procedures developed for NIST. Flexible User Interface - Set multiple Desktop configurations with up to seven independently configured windows to examine search results and match your needs. Use with Your Instrument Data Systems - Direct transfer between a number of commercial data systems and the NIST Search Program. Users may import their own chemical structures with selected user spectra. This is done in the Tools/Librarian section of the program by connecting a user-drawn structure in standard MOL-file format with a user spectrum. Such structure-drawing programs are widely available (for example, ISIS/Draw may be freely downloaded from http://www.mdli.com/prod/freesw.html). As before, if a user spectrum is given its CAS registry number and the Main Library has a structure for it, this structure will automatically be shown with user spectra unless the user has attached an imported structure to the spectrum. A variety of methods for automated searching and reporting of results are available. From the File menu selection, if Print automation is on, printing will follow each library search. A set of print options is also available from the "User Search Options" Window (select Search, then User spectrum). This is of particular use when using this NIST Program with other data acquisition programs. EI Library Expansion: Significant expansion of coverage of metabolites and designer drugs in the EI library, as well as the application of new computer-assisted evaluation methods for removal of low quality spectra. MS/MS Library Expansion: Greatly expanded NIST 17 MS/MS Library. Spectra include metabolites, peptides (biologically active peptides and all di-peptides and tryptic tri-peptides), contaminants, metabolites, lipids and more. New 'Hybrid Search' search type for all spectrum types, enable finding many more similar compounds in the hit list. It requires a precursor mass. New neutral loss search is available that eliminates restrictions on the maximum loss considered. Improved algorithms for scoring high mass accuracy searches that account for sparse spectra. Peaks shifted in the 'Hybrid Search' are shown before and after shifting. Searching by exact precursor m/z. A new EI Hybrid Search (Similarity/Hybrid). Hybrid searching uses both the logic of normal searching plus the logic of neutral loss searching. It uses the same algorithm as MS/MS Hybrid search with unit charges and Nominal MW instead of Precursor m/z. Search for an MS/MS spectrum in a library of MS/MS spectra. Uses the logic of normal searching and the logic of neutral loss searching. Only library spectra with the same precursor charge as that of the search spectrum are considered. If a search spectrum precursor charge is missing, it is set to +1. If "Peptide" check box in MS/MS tab of Library Search Options is selected, product ion charges from library spectrum peak annotations are used. Otherwise, all product ion charges are set to 1 or 2 in case precursor charge is 2 or greater. Neutral loss searching is done after changing library spectrum peaks' m/z values so that they have the same neutral losses with respect to the search spectrum precursor as they had with respect to the library spectrum precursor in the original library spectrum. This changed spectrum is compared to the search spectrum; found peak matches are included in the dot product. If a library spectrum peak matches different search spectrum peaks in both direct and neutral loss searches, its intensity is split between these two matches to maximize the dot product and keep total library spectrum intensity unchanged. The changed library spectrum product ions' m/z are calculated by adding (MS - ML)CM/CP, where M is precursor m/z, C is charge, subscripts are: S - in search spectrum, L - in library spectrum, M - in both precursors, P - in product ion. Precursor type constraint. Restrict MS/MS spectra in search results to specific precursor types, exclude isotopic precursors, display MS3 and higher spectra in addition to MS2. Works with NIST 17 nist_msms library. Rejects spectra which do not have correct Precursor type syntax. This is in addition to other filters for MS/MS spectra to limit hits by charge, precursor type, instrument, msn, and mass accuracy. An 'InChIKey' presearch for all Library spectrum searches. Finds all spectra which have the same first InChIKey segment as the search spectrum, and compares them to the search spectrum. InChIKey - Restrict search to only molecules with the first segment of InChIKey being the same as that of the search spectrum or a user supplied InChIKey. Use this presearch when the chemical structure or InChIKey of the search spectrum is known. To use this presearch, a library must be indexed by InChIKey. An older library may be indexed by selecting (Re)Index InChIKey from Tools menu. The search and found compounds do not have to have mass spectral peaks: hits with score=0 are included in the hit list. This allows to search nist_ri library. To retain all hits (up to 400) use Identity Normal, Quick, or Similarity Simple search. Other searches impose certain conditions on the library spectra thus excluding hits. Update list of libraries may be performed without exiting MS Search. Indexing old libraries for EI Hybrid, EI Loss, HiRes Any-peaks Peak and Loss searches, and InChI presearch. This includes third party libraries like the Wiley Registry. Structure Search Database Builder updates user library structure indexation. (Re)Index RI creates a file for using RI with a library. 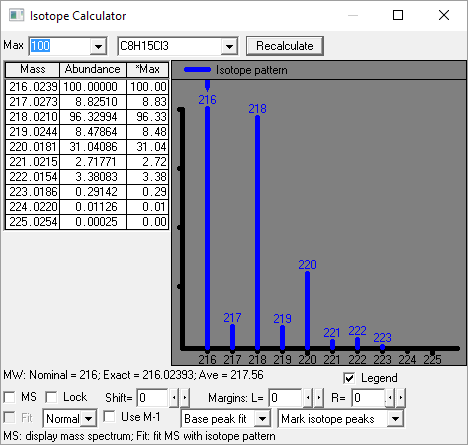 A new version of MS Interpreter allowing for high accuracy mass spectra and exact masses for fragment ions. New type of mass spectrum search: MS/MS Identity search for searching for MS/MS spectra in MS/MS libraries. The updated Lib2NIST converter is a tool for creating MS/MS libraries. To create a MS/MS library, run Lib2NIST and check "MS/MS spectra only" option. For this search to work, the MS/MS spectra must contain precursor m/z values. Derivatives for GC/MS can be represented as their precursor molecules using a large number of derivative types. Retention indexes in some of Main and Replicates libraries spectra. Automatic Retention Index estimation from chemical structure (right-click spectrum text window, select Properties, Retention Indices). Polar columns were new to the 2008 release. Structural replicates display (in addition to usual CAS number matching) in Main and Replicate libraries, including a new feature: displaying derivatives and a wider range of tautomers. Select matching method in Options, Replicates. Searching in the Contributor/Comment spectral records and extracting tagged fields into the displayed spectrum text information. Drag and Drop - Data can be dragged and dropped between windows. 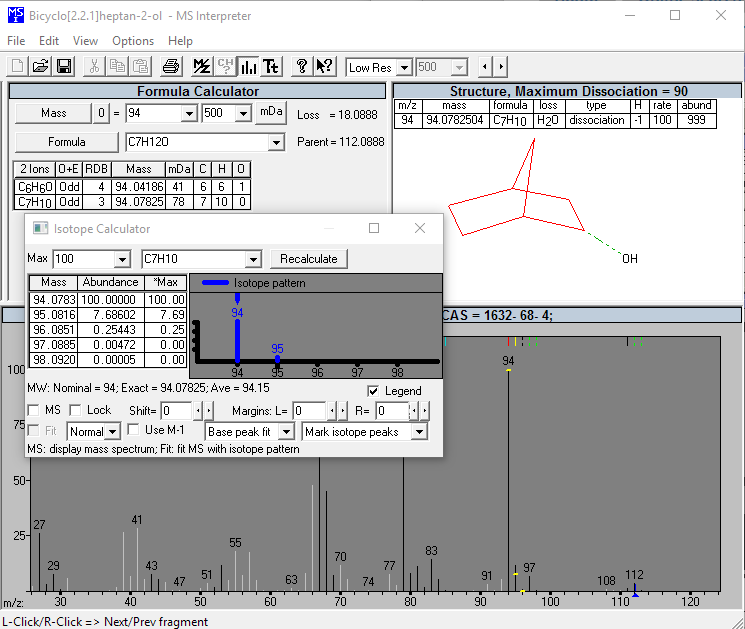 Point mouse to the name of the compound in the spectrum plot window, press and hold the left mouse button, drag the spectrum and drop it into Spec List or Compare Window. User Library Structures - This feature has been present for some time, but many are unaware of it. Compare Views - There are a number of different ways for you to visually compare two spectra. Direct interaction with a number of chemical drawing packages - the clipboard can be used with some of them, most can be used by use of intermediate files. The NIST MS Search program takes advantages of many normal Windows conventions. Look at the context sensitive options on the right mouse button click and on buttons at the top of the window. EI, MS/MS, and GC RI libraries have all undergone substantial enhancements in the 2014 release (see also statistics at the top of this page). EI MS Library: Spectra for nearly 30,000 new compounds have been added since the 2011 version, with increased attention to adding metabolites (plant and human), drugs, and compounds of industrial and environmental importance. Emphasis has been put on spectra for a wider range of derivatization methods. Extensive improvements in chemical names, structures and replicate spectra have also been made, with particular attention to improving naming for derivatives. Tandem MS/MS Library: The number of compounds from the 2012 version has increased by 30% to 9,345 (a 60% increase from 2011 version). With an increased focus on adding all possible precursor ions, this had led to an increased in the number of precursor ions by a factor of three relative to the 2012 version with a near doubling of the total number of spectra to 232K. All new spectra were acquired at high accuracy and resolving power, over a range of energies, and in both collision cells (beam type) and ion traps (up to MS3) in both positive- and negative-ion mode, when appropriate. A large proportion of these new compounds are metabolites, both from plants and humans. Spectra include metabolites, peptides (biologically active peptides and all di-peptides and tryptic tri-peptides), contaminants, lipids and more. Advanced noise removal processes have improved the quality of a number of spectra that appeared in earlier versions. Each spectrum contains extensive annotation, and now user libraries can be created with the same degree of annotation. The MS/MS library now also includes more than 5,000 glycan (native and fluorescently-labeled) spectra of over 100 compounds (a tenfold increase over the previous release), shown in standard "cartoon" format shown below. GI RI Library: RI data are provided for over 82,000 compounds, an increase of over 12,000 compounds from the 2011 version. More than 56K of these compounds have spectra in the EI Library. The total number of experimental RI values and GC Methods in this release is 387,463, which is an increase of over 10% from NIST 11. The detail of the GC Methods allows for the reproduction the analysis that resulted in the reported RI value and to see the original citation from which the data were derived. As with the previous release, it is possible to do a string search for text in the Text Info pane of a spectrum display to find keywords in titles or column types (RMB menu, Find selection). As has been the case for the last two releases the GC Method/Retention Index Library is also available without the mass spectral data and is provided with its own Search Program. Optional use of retention index (RI) in browsing and library searching. The RI can be displayed in the hit list and/or used for penalize the Match Factor in library searches. Indexing of older user libraries allows RI values saved in them to be used for library searching. Spectra imported into the Librarian tab can be assigned an RI value via the Edit function for library searching purposes. The simplified names for derivatives also help in the hit list. Additional information has been added to compound names in the Tandem MS library that show the precursor ion, instrument and energy. Search scoring for spectra with few dominent peaks—a common situation in Tandem MS—has been improved in 2012. 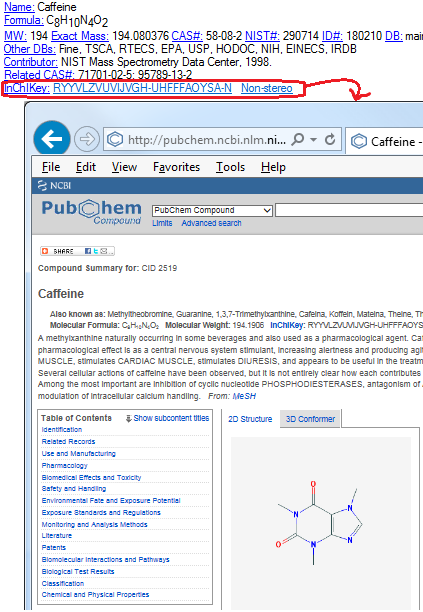 The InChI chemical identifier has been added to each compound (in EI, GC/RI, and small molecule MS/MS libraries) - clicking on it optionally bring up a NIH (PubChem) entry for the compound. to PubChem. These InChIKeys may also be used for searching compound information on the Web or for exact structure search in libraries. The spectrum editor and spectrum-import function have undergone significant enhancements to improve the development of user libraries. It is now capable of editing accurate mass data, adding certain field headers and contents, RI, and limited annotation of peaks. As existed in the previous version, it is still possible to use Comments Tags (see Help file) to add non-specific field headers and contents. The Other Names (Synonyms) of the dialog box is used to add Field Headers and the contents for those fields. Structure chirality features are now supported. This has been the case for user libraries in past releases, but is now also the case for the mainlib and replib of the EI Library, currently to a limited extent. The Spectrum Import function has a significant change. 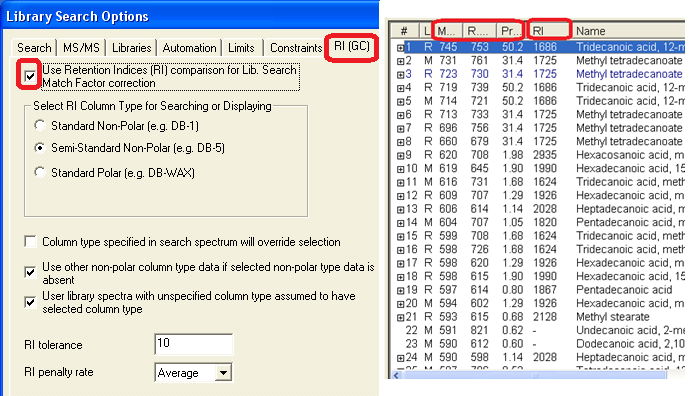 In prior versions of MS Search, spectra were imported only as integer m/z values MS Search v.2.2 provides far more control, including accurate m/z value imports with a specified number of decimal places for EI and in-source CAD spectra as well as spectra obtained using MSMS techniques. Import of "in-tandem" spectra, which do not include a defined m/z of the precursor ion. 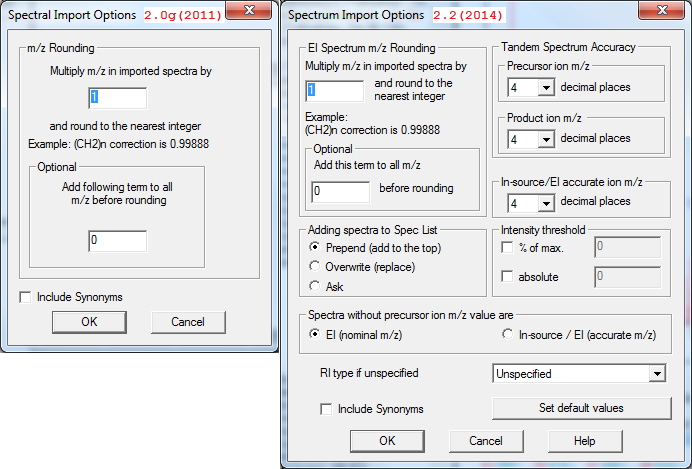 To import these spectra, select "In-source spectra" in Spectrum Import Options. In-source spectra have accurate ion peak m/z and intensities. The accuracy is set in Spectrum Import Options: ion peak m/z tolerance down to 0.015 ppm or 0.00006 m/z units. 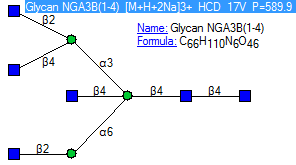 Importing and displaying Glycan structures in KCF format. A new In-source HiRes Identity Search for in-source/EI spectra with accurate m/z value ions was developed. This search is done against a user library containing in-source/EI accurate m/z-value or MS/MS spectra using libraries built with Lib2NIST. Search Options are set for MS/MS and In-source/EI with accurate m/z values in Spectrum Search Options dialog box that are located in MS/MS tab. Unlike the Identity MS/MS Search, this search does not compare precursor ion m/z values. 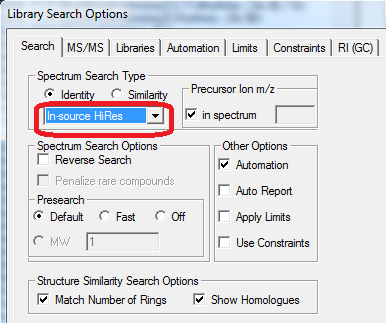 In-source spectra may be searched in In-source and/or MS/MS libraries with the new In-source HiRes search, Similarity Simple, Identity Normal or MS/MS Presearch OFF search options. For this purpose, adding Reverse Search option may useful. In-source spectra with accurate m/z may be added to a user library. Currently, these may be searched with In-source HiRes search only with the Presearch OFF option. Rebuild the library with Lib2NIST to get in-source HiRes search benefits. The 2011 release of the NIST/EPA/NIH Electron Ionization (EI) Mass Spectral Database. The NIST GC Methods and Retention Index Database. A new version of the NIST Mass Spectral (MS) Program (v.2.0g). Enhanced versions of MS Interpreter and AMDIS are also included with NIST11. EI Database expanded (~10%) and improved. MS/MS database expanded by 6x. Updated search software & utilities with new features. The NIST/EPA/NIH Database of Electron Ionization Mass Spectra now contains 243,893 carefully evaluated spectra for 212,961 compounds, an increase of nearly 10% from the 2008 version. This includes 23,433 new spectra of metabolites, drugs of abuse, derivatives of common compounds and many more, all measured specifically for this library. Other major enhancements have been made to the prior version including many replacements with higher quality spectra, a thorough review of chemical names and merging of the previous salts library into the main library. The NIST Database of MS/MS spectra has undergone an even greater enhancement. The new collection more than doubles the number of compounds represented. Further, most spectra have been acquired on both ion trap and qtof/triple quad instruments, thereby increasing the number of spectra by over a factor of six compared to the 2008 version. Spectra for the latter instrument classes have been acquired over a wide range to energies to ensure matching regardless of instrument collision settings. Also, when available, high mass accuracy spectra are stored. New spectra include metabolites, peptides (biologically active peptides and all di-peptides and tryptic tri-peptides), contaminants, lipids and more. The near-final version contains 9,934 ion trap spectra for 9,138 different ions of 4,649 compounds, and 91,557 collision cell spectra (qtof and tandem quad) for 6,939 different ions of 3,774 compounds. There have been a number of enhancements made to the NIST MS Search Program; not the least of which is the addition of an Exact Mass Search and the ability to sort Hit List by the number of synonyms and other databases (non-mass spectral databases) in which the compound can be found. Features introduced in NIST08, like the ability to use the EI Database and the Substructure Identification Tool in the interpretation of CAD spectra and the ability to display isomers and derivatives as replicate spectra, have been retained and are still available. Figure 1 shows one view of the new look of the Hit List window and Text Information window in the Lib Search Window of MS Search v.2.0g. 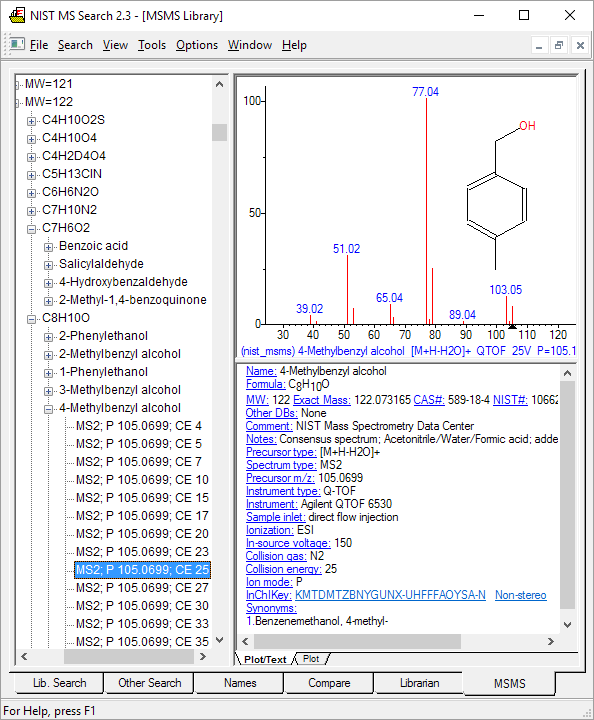 The NIST MS Search Program, since its introduction as a Windows version (v.2.0), has evolved into a power tool for not only the matching of spectra of unknown compounds against spectra for that compound in the EI and MS/MS Databases, but also the identification of unknowns encountered in toxicology, forensic, quality control, flavor and fragrances, environmental and many other fields through their mass spectra, regardless of the type of ionization or the analyzer used to determine the abundances of ions sorted according to their m/z values. The EI Database contains much more than just the mass spectra of compounds. It contains a primary and in many cases multiple synonyms including common and trade names. It contains names of other databases where specific compounds can be found, the name of the contributor, the compound's elemental composition, its nominal and exact mass, and the compound's chemical structure. The NIST MS Search Program can be an invaluable tool in GC/MS method development through the use of the GC Method/RI Database, exposed in the NIST MS Search program. This utility can also be enhanced by the addition of the new NIST GC Method/RI Search Program, which can be used by itself in the GC laboratory. The NIST MS Search Program has evolved out of the needs of those in the NIST Mass Spectrometry Data Center that use it and the Databases on a daily basis. Many user suggested enhancements have been add to the Program which is distributed with NIST11. Figure 1. Library Search Window of NIST MS Search provided with NIST11 with the Exact Mass Constraints dialog box overlaid. Note the Exact Mass field in the displayed Hit List spectrum and the two new columns for the number of synonyms for the compound and the number of other databases (non-mass spectral) containing the compound. The following is lists a number of new features available in the NIST MS Search Program v.2.0g. Only by exploring, using the Help available in the Program and looking at the electronic manual that is provided will it be possible to begin to see all the features and benefits. Only through extensive utilization and practice will it be possible to see the entire picture available with the NIST MS Search Program. 1. The NIST MS Search Program v.2.0g which accompanies NIST11 has had an Exact Mass Search added to the list of Other Searches. It takes into account the presence or absence of an electron, adducts; accepts uncertainty in ppm or millimass units, and allows searching for isotope peaks or monoisotopic peaks. This has been enabled for both molecular ions AND product ions. 2. An Exact Mass Constraint has been added to a Spectrum Search, Sequential Search, and Any Peaks Search. This Constraint (Figure 1) has the same properties as the Exact Mass Search. 3. The MS Interpreter program now enables high mass accuracy for both molecular ions AND product ions. 4. Any mass spectral database in the NIST MS Search Program's format (including all user libraries, the Wiley Registry, and Wiley's boutique libraries like MPW, DD20XX, FFNS, the Agilent DRS libraries, etc.) can be indexed to allow use with the Exact Mass Search or Exact Mass Constraint. 5. As long as a chemical formula is associated with a mass spectrum, not only is the nominal mass (MW) displayed but the Exact Mass is also displayed in the spectrum'ade;s Text Information window. 6. Optionally displayed columns in Hit Lists (MS Search and Other Search) have been added for the number of synonyms and the number of other databases that a compound from the NIST EI Database is in; the Hit List may be sorted according to the contents of these columns (Figure 1). 9. Toggle between Tab views (Lib. Search, Other Search, Name, Compare, Librarian, and MSMS Windows) using Crtl-Tab or Ctrl-Shift-Tab. 10. The NIST MS Search Program will now accommodate as many 127 separate databases instead of 16, which was the limit in previous versions of the NIST MS Search Program. 11. The NIST MS Search Program will now accommodate up to 1,048,560 spectra in a database instead of 786,420 spectra allowed in the previous version. 12. NIST11, like NIST08, is fully compatible with Microsoft® Vista™ and Windows 7™. 13. Tags in Comments Field: The concept of Tags (described below) was added to v.2.0f of the NIST MS Search Programs. Tags in the Comments field of a spectrum can be searched. 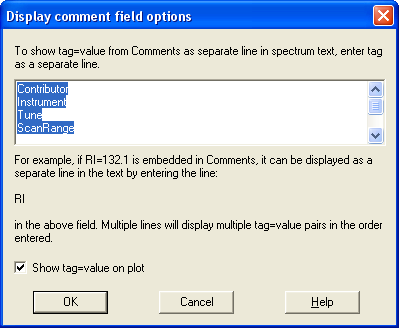 With respect to the spectra in the mainlib and/or replib Databases, when using the Sequential Search, by typing a text string in the dialog box as shown in Figure 2, the Contributor field will be searched. All spectra contributed by a single source can be identified in this way. This feature is continued v.2.0g and even further enhanced. 14. When clicking the Right Mouse button in a Text Information window to display the popup window, there is a Find option that allows the window to be searched for a specific text string. This is particularly useful with GC Method/RI records that are associated with spectra in the NIST/EPA/NIH Database. 15. One or more items from any Hit List may be copied into the Windows Clipboard as tab delimited Unformatted Unicode text and pasted into Excel™. The copying may be done from the Right-Mouse-button Menu or by pressing Ctrl-K (possibly subject to change) with the spectrum (spectra) highlighted. To select all the spectra in a Hit List, press Ctrl-A (a feature from NIST08). Note: Plain ASCII text, which may be obtained using Paste Special/Unformatted text, would not have proper Greek letters. Structures were provided by O. David Sparkman Contributor="University of the Pacific Mass Spectrometry Facility" Instrument="Agilent 5975 Inert XL MSD w/7890 GC" Tune="Standard Spec w/ PFTBA" ScanRange=35-400 GC_column="30 m x 250 µm with 0.3 µm film thickness of BD-5" OvenTemp="50 C 5 min. to 250 C @ 5 C/min" Synthesized="Matt Cutis"
As shown in Figure 5, the information preceding each equal sign (=) will be displayed as a Field title in the Text display of the spectrum and can optional be displayed with the Plot of the spectrum. The information following the equals sign (=) will appear following the Field header. Entry of Field contents (string) must conform to the rules above. In order for this display to occur, the Field titles must be registered in the Display comment field options dialog box shown in Figure 4 (View/Comment fields options). When the Tags have been entered into the Comment Field Options dialog box, they will not be displayed in the Comments field of the Text Information window. Figure 5 shows a spectrum (Plot and Text) with added Field headers. When a search is done of a User library that contains Tags (Field titles), it is possible to Constrain that search based on the Tag (Field title) and the partial or whole contents of the Tag (Field title). More specific details on the use of Tags as Constraints are in MS Search Help and Manual. 17. Display of Spectra of Derivatives as Replicate Spectra: One of the major new features with NIST MS Search (v.2.0f) in NIST08 was the ability to display spectra of derivatives as replicate spectra. If a spectrum of 1-octanol is in a Hit List and the mainlib or mainlib and replib databases have spectra of trimethyl silyl, pentamethyldisilyl, and/or acetate derivatives of 1 octanol, these would be listed as replicate spectra. When the replicates are displayed, actual replicates of compounds found in the replib database would be designated with an R. The spectra of the derivatives would be designated with either an m (in the mainlib database) or an r (in the replib database). This display feature is defaulted in MS Search 2.0f. To turn this feature off or modify it, use the Replicates Display Options dialog box called by Options/Replicates. This feature which first appeared with NIST08 has been enhanced for NIST11. 18. The MS/MS in EI option in the Spectrum Similarity Search is used with spectra of unknowns obtained by fragmentation process, EI or Collision Activated Decomposition (MS/MS spectra) for the determination of the probability of the Presence and Absence of substructures using the NIST companion Substructure Identification Tool. The MS/MS in EI option accesses neutral losses in the sample spectrum. A search against the neutral losses of the spectra in the NIST EI Database is then carried out. A Hit List containing EI spectra which have exhibited the same or similar neutral losses from the molecular ion of compounds in the EI Database is generated. Figure 6. 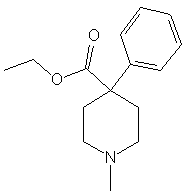 A spectrum obtained by MS/MS using the protonated molecule at m/z 248 obtained by electrospray as the precursor ion. Each spectrum in the EI Database is indexed according to substructures of the compound that generated the spectrum. Substructures are features such a functional group, heteroatoms, the number of rings-plus-double bonds (R+dB), etc. Figure 6 is a mass spectrum acquired using MS/MS in a 3D Quadrupole Ion Trap of a precursor ion with m/z 248 formed with positive-ion electrospray. This spectrum was searched using the NIST MS/MS in EI option Spectrum Similarity Search in the MS Search Program and the NIST11 EI Mass Spectral Database. The resulting Hit List (not of spectra of similar compounds but of EI spectra that exhibited the same natural losses as the CAD spectrum) was then analyzed using the Substructure Identification Tool. A portion of the Results are shown in Figure 7. 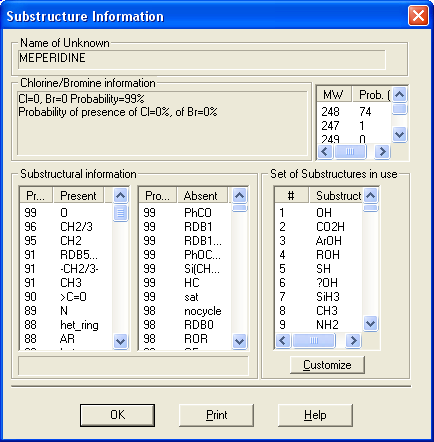 The Substructure Identification Tool indicated that there were probabilities ≥90% that the unknown contained one are more atoms of oxygen, had a R+dB count greater than five, that it contained both a methyl and a methylene group and that there was a substructure with both connected to one another, and a carbonyl group. There were probabilities >85% that the unknown contained one or more atoms of nitrogen, that there was an aromatic ring and a heterocyclic ring with nitrogen, a carbon oxygen bond, and many other substructures. The probability of the absences of substructures showed a >90% probability that there was not a phenyl carbonyl or phenyl methoxy, a dialkyl ether, an oxygen in a ring, benzyl moiety, an alkyl-aryl ether, or an aryl nitro group. Using these reported presences and absences it was not too difficult to establish a probable structure as shown to the left. Not only can the Substructure Identification tool be used in the evaluation of CAD (MS/MS Spectra), it can also be used in the identification of unknowns using spectra when there is no spectrum for the unknown in a database. 19. 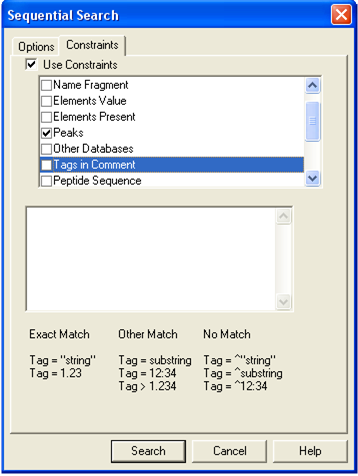 When performing Other Searches such as Molecular Weight, Sequential, and Formula Searches it may be desirable to change or include Constraints to limit the number of hits. This may need to be done for several iterations. To facilitate this, now when one of the Searches is requested the Search dialog box opens with Constrains tab display rather than the options tab (See Figures 8 and 9). Figure 8. (left) Search Dialog Box Displayed on Opening in NIST08. Figure 9. (right) Search Dialog Box Displayed on Opening in NIST11. 21. Spectra in the MSP text format can be imported from the Windows Clipboard into the Spec List via a Right Mouse button Menu option. 22. In the new mainlib-11 a relatively small number of compounds have more than one CAS registry number. These compounds may be found by the usual CAS r.n. search; a new file registry2.in6 in the NIST11 Main and Replicate Library-folders is required. If the registry2.in6 file is not present, then a regular CAS search is performed thus providing backward compatibility. The current version does not display these extra CAS r.n. 's; although, they are present as invisible synonyms. 23. The NIST MS Search Program can import centroided spectra from mzXML and mzData MS and MS/MS files. 24. An alternative peak matching method has been added to improve the reliability of the score when searching noisy MS/MS spectra. 25. The NIST MS Search Program is fully compatible with most recent NIST Peptide MS/MS Libraries. 26. 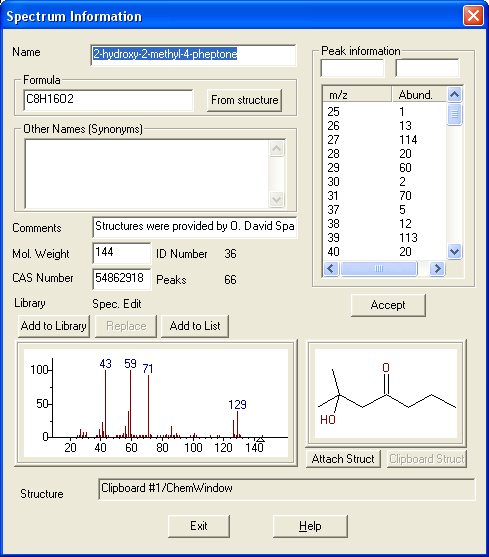 A chemical structure in the MOL file format can be inserted from the Windows clipboard into the Spec List in Librarian or Lib Search Window via a right-mouse-button menu command allowing for a Structure Similarity Search. 27. 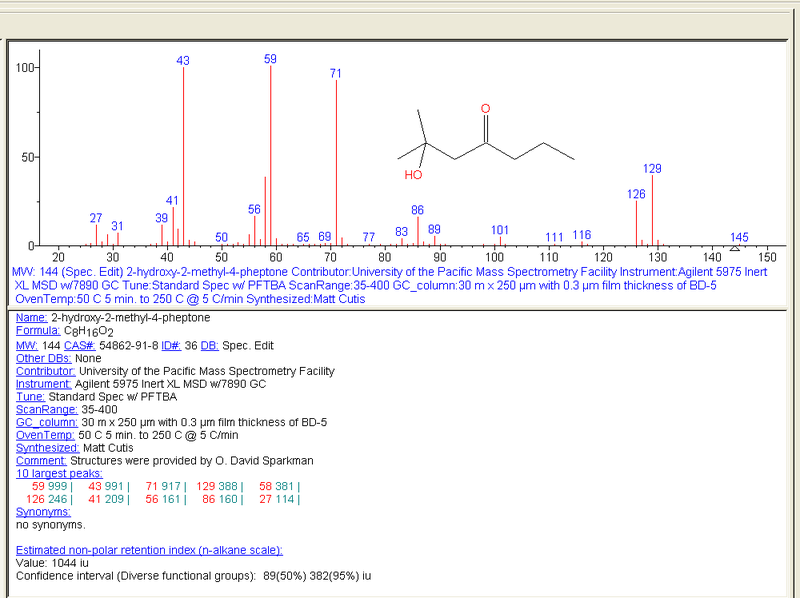 A chemical structure in the MOL file format located on the Windows Clipboard can be attached to the plot in Search Spectrum window displayed in the Lib. Search Window. The result may be subsequently sent to Spec. List and added to a user library (this undocumented feature was in the version of the MS Search Program distributed with NIST08 software). 28. Comments on the Compare Window and its undocumented abilities are to be added. See also the A few features of NIST08 MS Search that you might not know about. NIST 08 made the following major changes since NIST 05. Electron Ionization (EI) Library: The new library consists of 220,435 spectra of 192,262 compounds an increase of 15% over the previous version. NIST has, at the same time, continued to improve overall library quality by re-measuring and reexamining thousands of spectra. For example, it has been provided consistent identification for hundreds of salts and created a separable collection of low-volatile substances not expected to be measurable by GC/MS (717 spectra of 672 salts). Thousands of spectra of common derivatives and contaminants measured at NIST or by close collaborators have been added. As before, all compounds are represented by both names and chemical structures. GC Data Library: Includes 224,038 Kovacs indices for 21,847 compounds, an increase of over 50% from the previous version. Data include both non-polar and polar columns (NIST 05 had only non-polar columns). Most values were abstracted from the open literature and then compared to replicate values (average of 10 per compound) and estimates to find and remove errors. MS/MS Spectra: This release greatly expands our collection of MS/MS spectra by 250% to 5,308 different precursor ions. A large fraction of the new spectra are for contaminants and metabolites. Displays replicate spectra of derivatives/parent, tautomers, and optical isomers. NIST 05 made the following major changes since NIST 02. EI Library: This now contains 190,825 spectra of 163,198 different chemical compounds. In addition to the new spectra, important quality improvements have been made in both spectra and compound identification information. The binary format has not changed from the 2002 version, although several new files have been added that associate equivalent compounds and link individual compounds to the retention index library (see below). GC Data: This is a new addition, containing 121,112 Retention Index values for 25,893 compounds on nonpolar columns, 12,452 of which are compounds represented in the Electron Ionization Library. Full annotation is provided, including literature source and measurement conditions. These are provided in a format accessible by our Search Program. MS/MS Library: This is a new addition, containing 5,191 spectra of 1,943 different ions (1,671 positive and 341 negative ions). New structural replicates display (in addition to usual CAS number matching) Select matching method in Options, Replicates. Drag and Drop - Data can be dragged and dropped between windows. Compare Views - There are a number of new ways that you can visually compare two spectra. New, thermodynamics-base MS Interpreter program version 2.0 replaces the previous version. A spectrum with a structure may be sent to MS Interpreter by right-clicking the windows with a mass spectrum and structure and selecting Send To, MS Interpreter. NIST 02 made the following major changes since NIST 98 and previous versions. NIST 02 contains spectra of more than 147,000 compounds along with associated chemical identification data including chemical structures, synonyms, and other of relevant information. The best quality spectra are placed in the Main Library; and good-quality, alternate spectra are provided in the Selected Replicates Library, bringing the total number of spectra to about 175,000. This release represents the largest increase in both quality and coverage in the 25-year history of the NIST/EPA/NIH Mass Spectral Database--and for the first time that it can be stated that the library has been fully evaluated. The objective of this effort was to provide the best possible reference library for compound identification by mass spectral library searching. The AMDIS software extracts pure component spectra from complex GC/MS or LC/MS data files and searches against specialized libraries or the NIST library. This module was developed at the National Institute of Standards and Technology (NIST) for the critical task of verifying a major international treaty, the Chemical Weapons Convention. After two years of development and extensive testing it is now being made available to the general analytical chemistry community. AMDIS can operate as a "black box" chemical identifier, displaying all identifications that meet a user-selectable degree of confidence. Identification can be aided by internal standards and retention times. Libraries can be built directly from analyzed data files or from spectra in the NIST/EPS/NIH Database. AMDIS can also serve as a preprocessing tool for the GC/MS data files, automatically performing noise reduction for all components. It permits traditional library searching for any selected component. A flexible interface is provided to assist the analysis of complex matrices. Included as a separate utility, AMDIS attempts to reconstruct original mass spectra for individual components in arbitrarily complex GC/MS and LC/MS reconstructed total ion current (RTIC) chromatograms; and, if a target library is provided, can directly identify target compounds. AMDIS is especially useful when an RTIC chromatographic peak represents multiple components. Regardless of each component's concentration, pure mass spectra are deconvoluted for analyses. AMDIS was developed by NIST for the Defense Weapons Agency (Department of Defense) for verifying compliance with a major international treaty (Chemical Weapons Convention) ratified by the United States Senate in 1997. In order to meet the rigorous requirements for this purpose, AMDIS was tested against more than 30,000 GC/MS data files accumulated by the EPA Contract Laboratory Program without a single false-positive for the target set of known chemical warfare agents. While this level of reliability may not be required for all laboratories, this shows the degree to which the algorithms have been tested. AMDIS has been designed to reconstruct "pure component" spectra from complex RTIC chromatograms even when components are present at trace levels. For this purpose, observed chromatographic behavior is used along with a range of noise-reduction methods. AMDIS is distributed with specialized libraries (environmental, flavor and fragrance, and drugs and toxins), that were derived from the NIST Library. AMDIS has a range of other features, including the ability to search the entire NIST Library with any of the spectra extracted from the original data file. It can also employ retention index windows when identifying target compounds and can make use of internal and external standards maintained in separate libraries. A history list of selected performance standards is also maintained. AMDIS may also be downloaded separately. 9 minute video of loading GCMS data files in AMDIS and NIST library searching them. 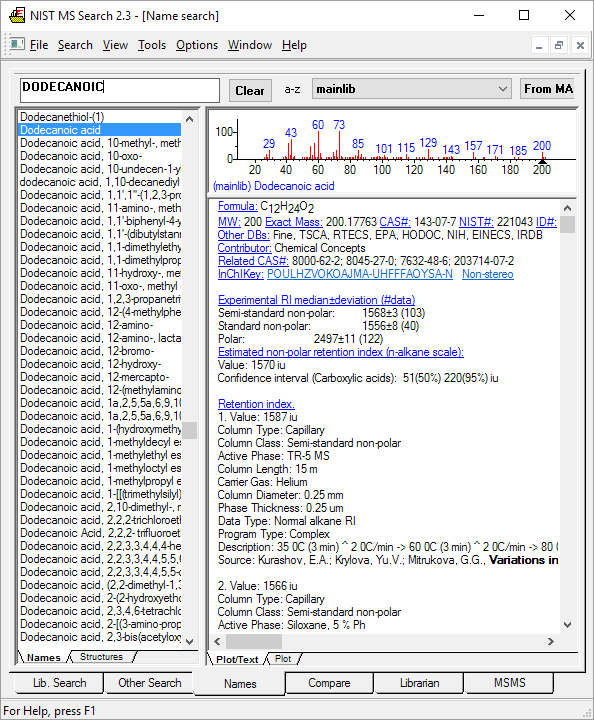 This utility enables the user to examine neutral losses, isotope patterns and possible chemical formulas along with computer assisted chemical structure/spectral analysis. 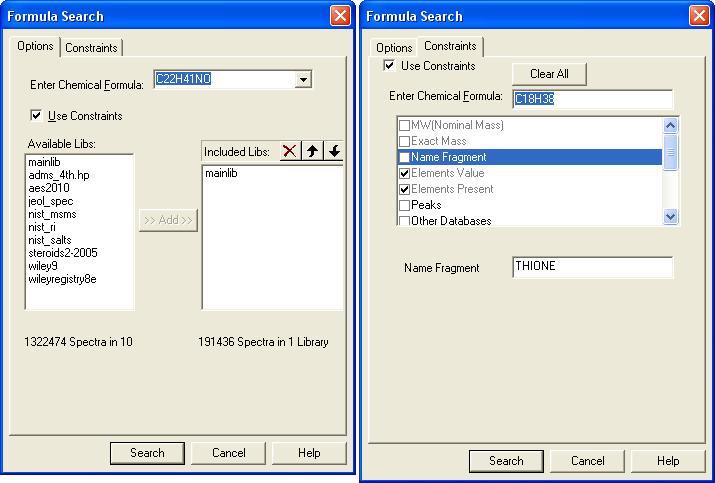 Starting with Version 1.5, the program has offered a unique means of interpreting spectra of compounds not identified in the Library by the User spectrum search. This is most useful when no acceptable matching spectra are found in a User spectrum search of the NIST Library. At this point, by selecting Substructure Information from the Tools menu, the current hit list is analyzed and statistical information on the composition of the unknown is derived from the hit list. For instance, the probability that any of a range of substructures are present or absent are listed (phenyl, acid, ester group, double bond, heteroatom, etc.) along with an estimate of the molecular weight and chlorine/bromine content (the latter is based only on the spectrum itself). This tool was developed to aid NIST evaluators in their analysis of mass spectra. In one integrated program, it permits a wide range of calculations on a mass spectrum using--if available--a proposed chemical structure. Spectra and structures are associated in the library facility of the Windows Search Program discussed above, and the program is activated from the Tools menu. Peaks in the spectrum originating as a logical fragment of the molecule are marked, and corresponding fragments may be highlighted. It also allows the analyst to keep track of important neutral losses, both from the parent or a derived ion, and to readily compute possible formulas for any peak or neutral loss and isotopic patterns as desired. Observed isotopic clusters can be compared to theoretical predictions subject to a number of user-specified constraints. Windows 10, 8.1, 8, 7, Visa, XP (both 32 and 64-bit editions) are fully supported. Windows 2000 is not compatible with NIST 17 MS Search (NIST 14 MS Search does work). ChemStation .L format will work. AMDIS version 2.63. Running 2.66 on NT 4 gives the error "AMDIS_32.EXE - Entry Point Not Found - The procedure entry point MonitorFromPoint could not be located in the dynamic link library USER32.dll". WinNT4Sp3+MSIE4.0/4.01/4.01SP1+hhupd.exe or WinNT4Sp6+MSIE4.01SP2 or later version of IE to access NIST MS Search HTML Help. Windows NT 4.0 SP1 and WinNT4Sp3+MSIE4.01Sp1+hhupd.exe under MS Virtual PC 2007 are the earliest versions of Windows that NIST14/11 has been tested. Windows NT 3.x, Me, 98, 95, 3.x are not compatible with NIST14/11 MS Search. ChemStation .L format might work. Complete installation (libraries, NIST MS Search program, and AMDIS) requires about 3 GB of free hard disk space..
Agilent ChemStation (or MassHunter) - The Agilent version of NIST is recommended for GC/MS ChemStation or MassHunter, as this provides the most seamless integration with Agilent data systems. This version includes a copy of the NIST library formatted in the Agilent library format (*.L) with structures, for searching by Agilent's PBM library search routines. Also, Agilent ChemStation (*.D) and MS Engine (*.MS) can be imported into AMDIS using the standard version of NIST. For LC/MS ChemStations (which don't use the .L library format), the standard version of NIST will work just as well. Thermo (Finnigan) - The standard version of NIST can be used with Xcalibur, which integrates directly with the Xcalibur data system. Also, Xcalibur Raw (*.raw), Finnigan GCQ (*.MS), INCOS (*.MI), ITDS (*.DAT) can be imported into AMDIS using the standard version of NIST. The NIST library in the Thermo Spectral ID is available in the multiformat version of NIST. Varian Saturn - The standard version of NIST can be used. Also, Varian (*.MS), SMS (*.sms), and XMS (*.xms) can be imported into AMDIS using the standard version of NIST. Waters MassLynx - The standard version of NIST is recommended, at least for MassLynx versions > 4.0. On search, the spectra is automatically transferred into the NIST MS Search window for library searching. (Older MassLynx versions only support the native MassLynx library format, which is available in the multiformat version of NIST and Agilent/Other version. In fact, newer MassLynx versions continue to support this method as well, but the information displayed has been reported to be more limited than with NIST MS Search--e.g. in terms of information displayed, search time, and 8-digit CAS number limit.) MassLynx NT (*.) can also be imported into AMDIS using the standard version of NIST. Waters Empower - Contact us for details. Please tell us what version of Waters Empower you are using. Shimadzu: NIST in the native Shimadzu GCMSSolution library format is available in the multiformat version of NIST, allowing searching (.qgd) directly from the Shimadzu software. The native Shimadzu library format has only been tested on recent 2.x versions of GCMSSolution software. 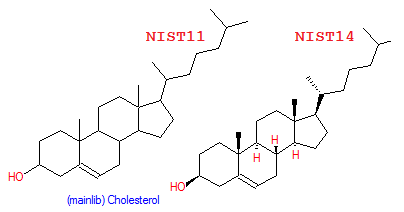 Chemical structure diagrams are not included in the native Shimadzu format itself, though you can still browse structures in the NIST MS Search software. Alternately, using only the standard (or any other) version of NIST, it is possible to import old Shimadzu QP5000/QP5050 "CLASS-5000" software MS (*.R*) files into NIST AMDIS, for searching instead from the NIST MS Search software, but this approach does not work with the newer .qgd files without first converting the .qgd to .cdf (e.g. using MASSTransit). PE TurboMass (*.raw) files can be imported into NIST MS Search via AMDIS using the standard version of NIST. NIST MS Search may also be directly integrated with the PE TurboMass software with the standard version (but call us for instructions). Also, NIST in TurboMass library format (.IDI/.IDB/.PDB/.PDI), where TurboMass will do the library searching without MS Search, is included the multiformat version of NIST. Bruker .MSF files can be imported into AMDIS using the standard version of NIST. INFICON GCMS (*.acq) can be imported into AMDIS using the standard version of NIST. PC software for Hapsite® supports NIST and AMDIS. JEOL/Shrader/GCMate (*.lrp) can be imported into AMDIS using the standard version of NIST. Shrader also has direct interfaces into the standard version of NIST. Contact us for details. Kratos Mach3 (*.run) can be imported into AMDIS using the standard version of NIST. Micromass (*.) can be imported into AMDIS using the standard version of NIST. Others/NetCDF (*.cdf) can be imported into AMDIS using the standard version of NIST. NetCDF is a vendor-neutral format supported by a number of data systems and GC/MS format conversion software (e.g. GC/MS File Translator and MASSTransit). Further information is in the NIST Help file (Help menu). "NIST 11: What's New and What Value Does it Offer?" by O. David Sparkman, Separation Science, sepscience.com, 2011. Part 1 - The history and current status of NIST 11 and its value to analytical scientists. Part 2 - The history and current status of NIST 11 and its value to analytical scientists (more). Part 3 - In Part 3, the use of the searches in the Other Search tab view is examined. These searches can be beneficial to the identity of compounds from mass spectra obtained by ionization techniques other than EI and from data that provides a higher accuracy of the measure m/z value than is usually available for EI data. Part 4 - This installment in the series on NIST 11 is about the Incremental Name Search, replicate spectra, and the NIST GC Methods, and Retention Index Database. 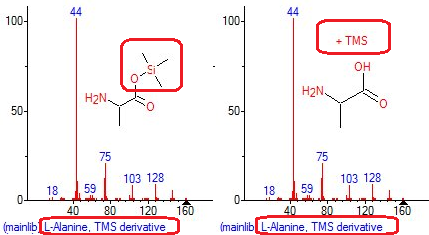 Part 5 - Shows how how spectra obtained by MS/MS methods from various soft ionization techniques, including those used with LC/MS can be searched against NIST MS and the results used to facilitate a structure determination. 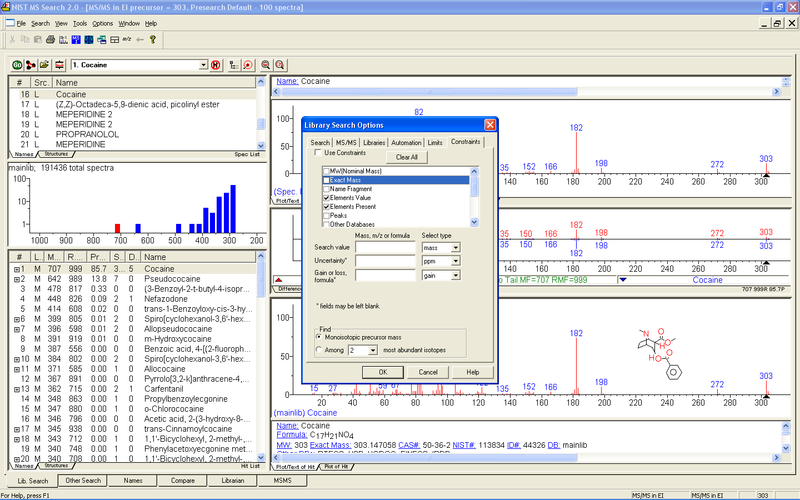 software: Tal-Aviv Molecule Identifier (TAMI) - The TAMI software automatically analyzes your measured mass spectra, based on the analysis of the measured isotopic pattern of the molecular ion (Isotope Abundance Analysis – IAA), and links with NIST's MS Library to confirm or reject its identification results. This significantly enhancing the confidence level in the NIST library identification. In addition, TAMI independently provides the sample elemental formula in case it is not in the library. MolView - free web-based ".MOL" file (molecular structure) editor. ".MOL" files can be imported/exported from NIST MS Search. Download NIST 17 Demo. The demo differs from the full version of NIST mainly in that it contains a very small subset of the EI database and a slightly older version of the software (about 2300 spectra). Also, this is a demo does not contain the Agilent integration (ChemStation/MassHunter macros nor NIST in the ChemStation .L format), although you can load Agilent .D files into the included NIST AMDIS program, which in turn integrates with NIST MS Search. The demo also does not contain MS/MS spectra, although there is a separate peptide demo available for that (NIST MS/MS peptide demo). Note: For some MS data systems that search for the NIST MS Search program location in the "c:\windows\win.ini" (or "c:\winnt\win.ini") file, you might need to edit that file in a text editor to change the line "[NISTMSDEMO]" to "[NISTMS]" like the real version of NIST. 2011-12-28 - An updated ChemStation macro (NISTSrch.mac) is available to avoid interference in situations where both ChemStation and another search system (e.g. Xcalibur or Masslynx) are used simultaneously on the same computer (by reusing the autoimp.msd file). [download ZIP] (contains NISTSrch.mac and install instructions). 941010 NIST 17 Standard Version 3 $2645.00‡3 or more: 5% off; 10 or more: 7% off. 941010HP NIST 17 Agilent Format Version. (Includes Standard Version) 0*Lead time for this non-stock item is approximately 7 days. $2945.00‡3 or more: 5% off; 10 or more: 7% off. 941010UG NIST 17 Standard Version, UPGRADE 2 $1525.00‡3 or more: 5% off; 10 or more: 7% off. 941010HPUG NIST 17 Agilent Format Version, UPGRADE. (Includes Standard version) 0*Lead time for this non-stock item is approximately 7 days. $1757.00‡3 or more: 5% off; 10 or more: 7% off. ‡ Quantity discount 3 or more: 5% off; 10 or more: 7% off. The standard version of NIST (941010) is recommended for most users (except for Agilent ChemStation/MassHunter and Shimadzu GC/MS Solutions). It includes the NIST library formatted in NIST format, which is the native format understood by the NIST MS Search program, which integrates with a number of data systems (e.g. Varian Saturn, Thermo Xcalibur, Waters MassLynx version >= 4.0). 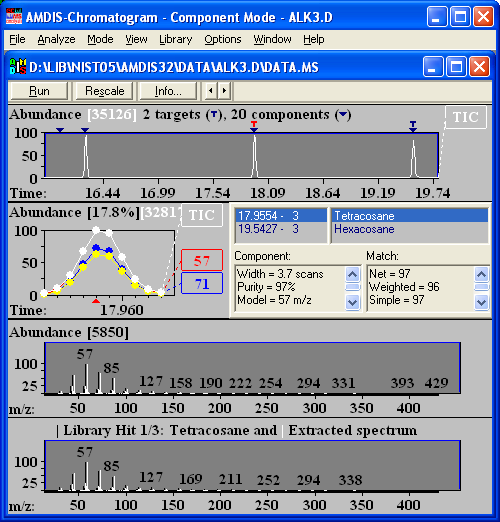 GC/MS, LC/MS, and MS spectra from many data systems can also be imported indirectly into AMDIS (see above) and then library searched via the AMDIS-NIST MS Search program integration. The Agilent format version of NIST (941010HP) is recommended primarily for most Agilent ChemStation/MassHunter users. It includes everything in the standard version plus the NIST EI library formatted in the Agilent .L library format for library searching directly from Agilent software (e.g. Data Analysis PBM search). The Multiformat version of NIST (941010MF) is recommended for Shimadzu GCMSsolution users in particular. It includes everything in the standard and Agilent versions of NIST plus the following additional native formats: Shimadzu GCMSsolution, Waters MassLynx, and Thermo Spectral ID. Other formats may be available upon request. Further details are in the System Requirements tab above. 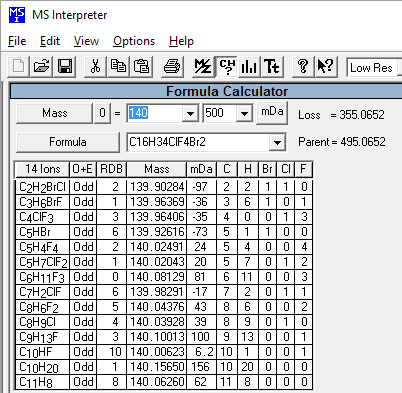 Other databases available: The NIST mass spectral database is a strongly validated and extensively used MS library of general compounds recommended for most all users. Users looking for a larger library or libraries dedicated to certain classes of specialty compounds may wish to augment their NIST database with one of the Wiley MS libraries. A few features of NIST08 MS Search that you might not know about.